Nigeria’s Super Eagles have moved four places up in the October world football rankings released by FIFA yesterday. With two straight wins against Tanzania in the Africa Cup of Nations qualifier and Zambia in the FIFA World Cup qualifier, the Super Eagles jumped from their 64th placing previously to berth at the 60th spot. They occupy the 11th position on the African rankings, where Cote’d Ivoire still maintains its number one position. Senegal, Algeria, Tunisia, Ghana, Egypt, Congo, Congo DR, Mali and Cameroon make up the Africa top ten. 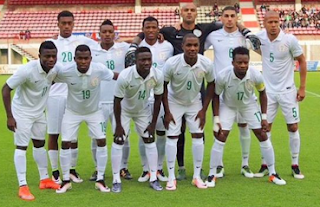 The Super Eagles will host Algeria next month in the FIFA World Cup qualifier in Uyo, Akwa Ibom State. In the world rankings, Germany and Brazil moved closer Argentina who remain to No. 1 side on FIFA’s latest world rankings as Belgium dropped out of the the top three for the first time in 19 months. Following the latest international action in the qualifying stages for the 2018 FIFA World Cup, further changes to the top 10 saw France leapfrog Euro 2016 winners Portugal into seventh place and Spain replace Wales in 10th spot. Colombia dropped down to fifth while Chile remain sixth, and Uruguay stayed in ninth to complete the top 10.